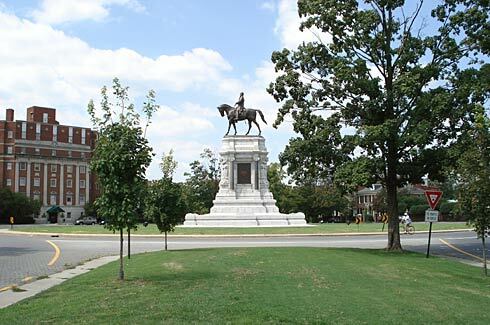 WHAT: Confederate General Robert E. Lee on Monument Avenue in Richmond, Virginia. WHERE: Monument and Allen avenues in the center of a grass island in the roundabout. DESCRIPTION: A grand and imposing equestrian bronze figure 21 foot high, mounted on an oval-shaped granite pedestal 40 foot high, which is flanked on both sides by two gray marble columns. The statue is oriented to the south and was the first constructed on Monument Avenue. The traffic flows around this monument in a roundabout, starting in 2004. This monument is the one that draws the most “Wows” of all the Monument Avenue statues from first-time visitors. It is the biggest, tallest and most imposing statue of all in Richmond — even bigger than the George Washington equestrian statue at Capitol Square. The traffic circle is wide and the inside has grass, so it is also the most approachable monument on the avenue. People can sit in the circle and watch traffic, catch sun rays and just hang out with General Lee. There rarely is a bad time of day to photograph the statue as well, as he is facing south and even in the winter, if the sun is shining, it will be on his face instead of his horse Traveller’s backside. HISTORY: Lee graduated from West Point Military Academy. He became a Captain in the Mexican American War. He had also served as a superintendent at West Point. There he was responsible for training future soldiers. Based on his military accomplishments, he was asked by President Abraham Lincoln to lead the Union army. Lee turned down the position due to his loyalty to Virginia. Lee traveled to Richmond in 1861 to accept charge of the Army of Northern Virginia. He later served as a military advisor to Jefferson Davis, President of the Confederate States of America. Confederate General Robert E. Lee showed his skill of organization as he prepared 40,000 troops for battle. His men held him in high respect and obediently carried through his orders. Lee’s greatest battles included the battles of Antietam, Chancellorsville, Fredericksburg, and Gettysburg. On the afternoon of April 9, 1865, Lee surrendered to General Grant of the Union army at Appomattox Court House, marking the end of the Civil War. After the war Lee became the president of Washington College, which is now called Washington and Lee University. On October 12, 1870 at age 63, Lee passed away at Washington and Lee. He is buried under Lee Chapel there. Lee’s horse, Traveller, became well-known as he carried Lee throughout the Civil War. The horse died in June 1871 from stepping on a rusty nail. This statue and all confederate heritage is the reification of white supremacy. The Confederacy was a political Union to ensure the Souths wealth and prosperity, which mainly relied on the institution of slavery. That is why people want them removed. I was born and raised in the north, and now live here in the Richmond area. Why anyone would want to remove this great man from this monument without knowing his history is absurd. Long live the history of Gen. Robert E. Lee. afterward he must be go to see this web site and be up to date daily. Hail the great Robert E. Lee!!! Lee remains an enigma in American history. He professed a hatred of war, yet could not (or would not) let go of a war that he knew was lost after Gettysburg. He professed to love Virginia above all other places on earth, yet persisted in a fight that ruined the state, killed off the best of its manhood, and retarded its recovery for several generations. It’s an unfortunate byproduct of the myth of the “Lost Cause” that Lee has become an untouchable in the Southern mind — the saintly man on horseback whom one does not criticize. (The Monumenr Avenue statue probably plays a large part as an icon of this view of Lee.) It’s just possible to argue that Lee came to be Virginia’s, and the entire South’s, worst enemy for the last two years of the war. There was no better soldier that R.E Lee. He chose to fight those who were going to make him in command of murdering his kin and friends. No man would have ordered the murder of those closest to him. He had to fight against the Yankee hoards wanting to dictate to his people, not to mentions murder them as Sherman did. Would you have ordered the murders of your family and friends. I think not, unless you are a very twisted soul. Are you describing the Viet Nam war??? Does anyone condemn Kennedy or Johnson or so many of our service members who gave up their lives for honor and love of thy brother and ideals of this country?? The school children of the city pulled the statue by ropes on a wagon from the railroad car to the spot on Monument Ave.
My grandmother was one of the children. I saw a picture many years ago, but don’t remember if it was a postcard or a picture.